Located in southern Europe, Italy is slightly larger than the state of Arizona. Most of Italy is mountainous, and it is home to Mount Vesuvius, the only active volcano on the European mainland. A fertile valley surrounds the Po River, the largest river in Italy. Many different plants thrive in its rich soil. Italy is surrounded by water on three sides and benefits from a variety of seafood and coastal vegetation. Climate varies depending on elevation and region. Colder temperatures can be found in the mountainous regions, particularly within the high peaks of the Alps, a mountain range in the northwest. Temperatures are warmer in the Po River valley, the coastal lowlands, and on Italy's islands (Sicily and Sardinia), with an average annual temperature around 60°F. Plants and animals also vary depending on elevation and region. Italy hosts a wide variety of trees, including conifers, beech, oak, and chestnut in the higher elevations. Evergreens, cork, juniper, laurel, and dwarf palms are widespread throughout the Po River Valley and Italy's islands. contributed to differences in the country's cuisine. 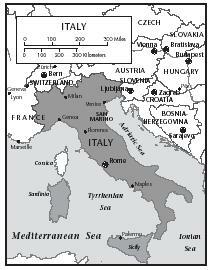 Italy changed in many ways when the economy flourished following World War II (1939–45). During this time, farming was modernized and new technologies and farming systems were introduced. Various culinary practices throughout the country's regions began to be combined after people started migrating from the countryside to the cities. Many southern Italians traveled to the north at this time, introducing pizza to northern Italians. Those from the north introduced risotto (a rice dish) and polenta (a simple, cornmeal dish) to the south. Fast foods, mostly introduced from the United States, have brought more culinary diversity to Italy. However, pride in the culture of one's region, or companilismo, extends to the food of the locality, and regional cooking styles are celebrated throughout the country. Although Italians are known throughout the world for pizza, pasta, and tomato sauce, the national diet of Italy has traditionally differed greatly by region. Prior to the blending of cooking practices among different regions, it was possible to distinguish Italian cooking simply by the type of cooking fat used: butter was used in the north, pork fat in the center of the country, and olive oil in the south. Staple dishes in the north were rice and polenta, and pasta was most popular throughout the south. During the last decades of the twentieth century (1980s and 1990s), however, pasta and pizza (another traditional southern food) became popular in the north of Italy. Pasta is more likely to be served with a white cheese sauce in the north and a tomato-based sauce in the south. Italians are known for their use of herbs in cooking, especially oregano, basil, thyme, parsley, rosemary, and sage. 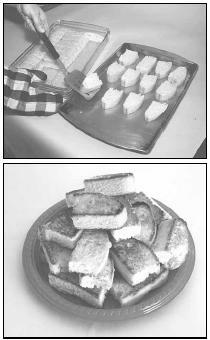 Cheese also plays an important role in Italian cuisine. There are more than 400 types of cheese made in Italy, with Parmesan, mozzarella, and asiago among the best known worldwide. Prosciutto ham, the most popular ingredient of the Italian antipasto (first course) was first made in Parma, a city that also gave its name to Parmesan cheese. 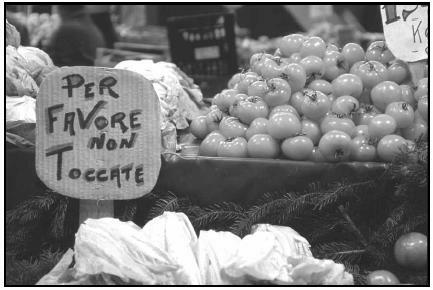 To protect his produce from too much handling, this vendor displays a sign reading "Please don't touch" in Italian. Per favore is "please." Place water and beans in saucepan. Bring to a boil over high heat for 3 minutes and remove from heat. Add the onion, tomatoes, celery, carrots, garlic, smoked ham, and bay leaves. Mix well and bring to a boil over high heat. Reduce to simmer, cover, and cook until beans are tender (about 1½ hours). Stir frequently. Add macaroni and mix well. Cover and continue simmering until macaroni is tender (about 12 minutes). Remove and throw out bay leaves before serving. Serve hot soup in individual bowls with a side dish of Parmesan cheese for the guests to sprinkle into their soup. Serve with crusty bread to dip in the soup. Cook pasta according to directions on package. Warm a serving bowl in the oven set to the lowest temperature until ready to use. Place butter or margarine in a mixing bowl, and using a wooden spoon, beat until light and fluffy. Gradually add cream and mix until well blended. Add the cheese by Tablespoon, beating well after each addition. Using oven mitts, remove the heated serving bowl from oven and place on a heatproof work surface. Place the drained, cooked pasta in the warm bowl and add cheese mixture. Make sure all the pasta is coated with the sauce. Add salt, pepper, and nutmeg to taste and continue to coat pasta. Serve while very hot with a side dish of grated cheese. The dish goes well with a green salad with Italian dressing and warm garlic bread. Note: This recipe involves hot oil. Adult supervision is suggested. Spread out veal scallops and lay one sage leaf and one slice of ham on each. Lightly dust each with flour. Heat the butter and oil in a skillet large enough to hold all the rolls in one layer. Sauté, turning the rolls carefully, until brown. Lift the veal from the pan and set aside on a warm platter. Add the wine to the skillet, add salt and pepper to taste, and cook to reduce the size by half. Arrange the hot spinach on a warm dish, place the veal on it, and cover with the wine sauce. Every Italian village celebrates its own saint's day with a festival featuring fireworks, feasting, and dancing. The traditional main dish for these festivals is roast suckling pig. A popular Easter dish throughout Italy is Agnellino (roast baby lamb), often served with roasted artichokes. Although the holiday bread called panet-tone is the best known of Italy's many holiday desserts, regions throughout the country have their own traditional holiday sweets featuring local ingredients. In the north, butter is a major ingredient of these desserts. Zelten cakes, similar to fruitcake, are filled with raisins, dates, figs, almonds, pine nuts, orange peel, rum, and cinnamon, are baked two or three weeks before Christmas because they improve with time. Strudel is popular in the Tyrol region in northern Italy. In the south, dessert recipes are more elaborate and use olive oil (instead of butter), lots of eggs, candied fruit, and honey. Among the best known are struffoli , fried cubes of egg pastry covered with honey and sprinkled with colored sugar, a specialty from Naples. In a mixing bowl, combine 1 cup flour, sugar, yeast and salt. Add milk and butter; beat 2 minutes on medium. Add 2 eggs and ½ cup flour; beat 2 minutes on high. Stir in the fruit, nuts, and anise seed, mixing well. Place on a lightly floured board and knead until smooth, 6 to 8 minutes. Place in a greased bowl; turn once. Cover and let rise in a warm place until doubled, about 1 hour. If desired, dye remaining eggs (leave eggs uncooked); lightly rub with oil. With a fist dipped in flour, punch dough down. Divide in half and roll each piece into a 24-inch rope. Loosely twist ropes together; place on the baking sheet and form into a ring. Pinch the ends together. Gently split ropes and tuck eggs into openings. Cover and let rise until doubled, about 30 minutes. Bake for 30 to 35 minutes, or until golden brown. Remove from the pan and cool on a wire rack. Dissolve yeast in the water. Mix in the butter, sugar, salt, eggs, and yolks. Stir about 10 cups of flour into the butter and yeast mixture until blended. Spread a little flour on a board. Turn dough out onto the board and knead for 8 to 10 minutes. When the dough is soft and smooth, knead in the citron and raisins. Place dough in a greased, round pan, and brush the top with melted butter. Cover, and allow to rise until the dough has doubled in bulk (about 1 hour). Using a sharp knife, cut a deep cross in the top of the loaf. Bake for about 8 minutes, or until the top begins to brown. Lower heat to 325°F and bake for 1 hour more. Beat eggs. Add sugar and beat until thick and golden. Add melted butter and oil and beat well. Add vanilla or almond extract and blend well. Add flour and baking powder, and beat until a thick dough forms. Turn dough into ungreased 9-inch by 13-inch pan. Remove from oven and slice into three strips, 3 inches by 13 inches each. Cut each strip into slices about 1 inch wide. Place slices on a cookie sheet. Toast slices under the broiler. Turn, and toast other side. Biscotti should be crunchy. Serve with coffee. Makes about 24 biscotti. (Top) The baked biscotti are placed on a cookie sheet, ready to be toasted under the broiler. (Bottom) When done, biscotti should have a light, crunchy texture. Italians generally eat three meals a day. Adults eat a light breakfast ( la prima colazione ), often stopping at a coffee shop on their way to work for a caffellatte (coffee with milk) or cappuccino with bread, butter, and jam, or cake. Lunch and dinner are similar meals. They consist of an antipasto (an appetizer based on cold meats), a pasta or rice dish (depending on the region) such as risotto, a main meat or fish course, a salad, and cheese and fruit. Lunch ( il pranza or la seconda colazione ) is the main meal of the day for many Italians and is eaten between noon and 2 P.M. Whether eating at home or in a restaurant, Italians take food seriously. They prefer to dine in a leisurely fashion, savoring their meals over a bottle of wine and conversation. Wine and bread are always served during main meals. Even children are often allowed a taste of wine. In southern Italy, where people take a long break during the hottest part of the day, dinner ( la cena ) is served later than in the north, often after 7:30 P.M.
Italian cities. However, increased interest in traditional dishes and consuming healthy, lighter meals has helped these snacks become popular again, even in the United States. Place eggs and parsley into a bowl and beat well. Swirl the oil around in skillet to coat the bottom. Add the egg mixture. Arrange zucchini slices in a single layer on top of the eggs. Cook for 3 to 4 minutes. Hold a lid over the pan, and turn the pan over, flipping the frittata into the lid. Carefully slide the frittata back into the skillet, cooked side up. Cook other side until firm, about 2 more minutes. Add salt and pepper to taste. Cut into 4 or 6 wedges. Serve warm or at room temperature. Serves 4 to 6. 1. Grill or broil the bread on each side. 2. Rub each slice with a crushed garlic clove, letting the juices sink into the bread. 3. Sprinkle olive oil and salt on the bread. 4. Serve warm, if possible. Mix the ricotta with the powdered sugar until it is no longer grainy. Blend in the candied fruit and chocolate. Whisk until the mixture is very creamy. Place filling in a wide-nozzled pastry tube and fill the shells. (A spoon may also be used). Place the chopped nuts on a flat surface and lightly dip both ends of the cannoli into the nuts to decorate. 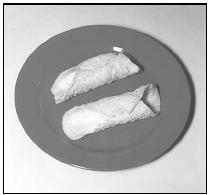 Unfilled cannoli shells are available in most supermarkets. The government in Italy controls much of the agriculture of the country. It controls how much wheat can be produced, for example, and how much wheat can be imported. The government was not successful during the 1990s in its efforts to increase agricultural production. Italy imports about one-half of its meat, and in the late 1990s and through 2001, concerns over European beef because of mad cow disease and hoof and mouth disease caused the prices of beef to increase. Field, Carol. Italy in Small Bites. New York: William Morrow, 1993. Lukins, Sheila. All Around the World Cookbook. New York: Workman, 1994. Penza, John, and Tony Corsi. Sicilian and American Pasta: 99 Recipes You Can't Refuse . Berkeley: Ten Speed Press, 1994. Roden, Claudia. The Good Food of Italy, Region by Region. New York: Knopf, 1991. Delicious Italy. [Online] Availabe http://www.deliciousitaly.com/ (accessed August 7, 2001). Epicurious: For People Who Eat. [Online] Available http://epicurious.com (accessed February 11, 2001). International Women. [Online] Available http://www.internationalwoman.net/recipesitaly.htm (accessed August 7, 2001). Lidia's Italy. [Online] Available http://www.lidiasitaly.com/ (accessed August 7, 2001). I just want to say Thankyou for having this website, I am doing a project for school on Italy and it has helped me out tremendously. I'm a Chinese student.I'm 16. I am doing a project for school on Italy food ,but I don't know Italy at all.Thank you for the website. I hope to meet friends here. i love italy and i am about it reading about it!!!!!!!!!!!!!!!!!!! I also liked your web site. My Brownie Girl Scout Troop is doing a World Day to get to know other cultures and our country is Italy! Your receips really helped us deciede what we should make.